Statistical power is the probability of finding an effect of a specified size, if it exists. It is of critical importance to interpreting research, but it’s amazing how little attention it has got in undergraduate statistics courses. Of course it can be argued, that up until recent years, statistics in psychology was taught by those who were effectively a part of the problem. I can’t recommend enough this wonderful summary of Cohen’s classic article about how psychology failed to take it seriously in the 20th century. Once more: if your study is underpowered, you not only fail to detect possible effects, but also get unrealistic estimates when you do. Recently, I’ve had the interesting experience of having to figure out how to do sample size calculations in a cluster-randomised setting. This essentially means that you’re violating the assumption of independent observations, because your participants come clustered in e.g. classrooms, and people in one classroom tend to be more like each other than people in another classroom. It also pretty much churns your dreams [of simple sample size specification] to dust. 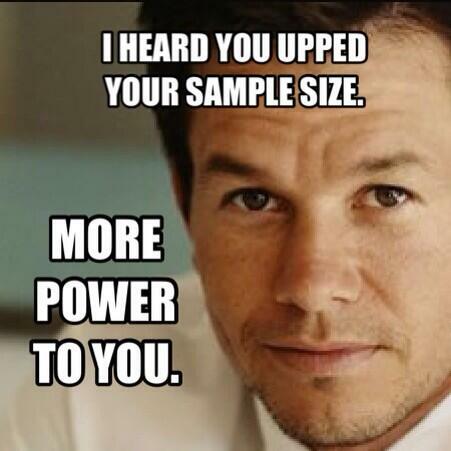 That’s probably the case, Research Wahlberg. But HOW MUCH more?! This intra-class correlation is killing me! I want to make it perfectly clear that I still know very little about power analysis (or anything else, actually) and made these as tools to help me out because my go-to statistician was too busy to give me the support I needed. Sources and justifications are provided, but it’s not impossible these calculations are totally wrong. 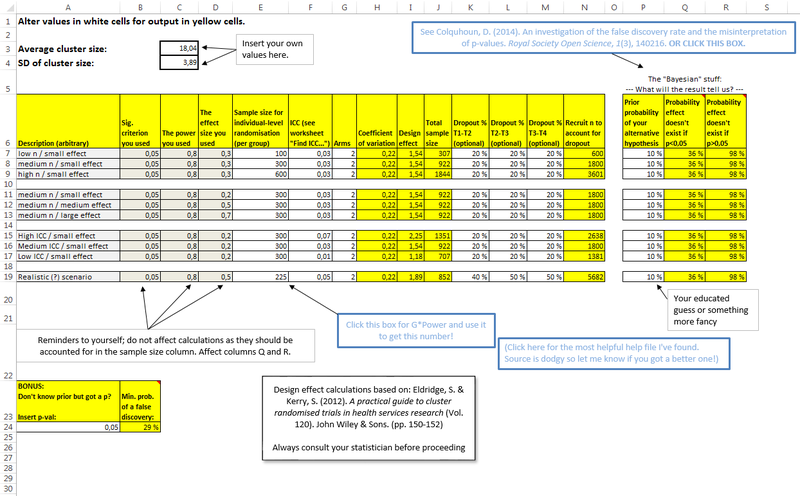 Use this sheet to calculate sample size for 2-level cluster randomization when you know power and a bunch of other stuff. Some links and guidance is included. Also includes two toys (the rightmost and the bottom yellow blocks) that give you optimistic estimates of whether your “discovery” is false. These are based on this paper. I highly recommend it if you want to make sense of p-values. One of the big boogiemen, to me at least, of the whole enterprise was the intra-class correlation (apparently, often used synonymously with “intra-cluster” correlation). I jotted down instructions that I wish I had when I began meddling with this stuff. Here’s the dream crusher. In the “Justifications…”-sheet you’ll find mathematical formulas and the logic behind the machine, but it’s not super obvious for us mortals. I managed to make it work in Excel by combining pieces of code from all over the internet; I’m hoping you don’t need to do the same. Have fun and let me know if you find errors! All other comments are of course welcome, too.